Over the last few months, I’ve written a LOT about milk allergy in babies. Or dairy free breastfeeding. CMA Breastfeeding (Cow’s Milk Allergy Breastfeeding). Milk protein allergy. Cow’s Milk Allergy. Or MSPI (milk and soy protein intolerance). Whatever you want to call it. They all mean the same thing. What it means is that your baby’s immature digestive system has a difficult time digesting the proteins found in dairy milk and soy. It also means that even though it might not feel like it at the moment (or even a few weeks from now), breast milk is the BEST thing for your MSPI baby. Why have I written so much about milk allergy in babies? Because I was right where you are. On two different occasions actually. And I recieved SO much misinformation. My own Pediatrician told me that my options would be either to give my baby soy formula or to cut dairy milk and cheese from my diet. Thankfully I did my own research and realized that soy formula would have been a disaster (up to 50% of babies that are intolerant to milk are also intolerant to soy and my baby was one of them). I also quickly realized that cutting dairy from my diet meant a lot more than just cutting out dairy milk and cheese (much to my dismay). I spent so much of the time when I should have been bonding with my baby agonizing over every little thing, and researching every single stage until she outgrew her intolerance at 15 months old. I was constantly trying to learn about her symptoms, how and what solids to introduce to her, why she was suddenly fussy, what I might have eaten that was bothering her, and I was CONSTANTLY hungry and searching for new recipes and snacks to eat. It. Was. Exhausting and stressful. When I became a blogger, I knew that MSPI was going to be one of the things that I would blog about. Because I want to help other moms NOT go through what I did. Knowledge is power, and good, healthy, simple recipes are fuel for our milk-producing bodies. I want you to be able to continue breastfeeding if that’s what you want to do. I want you to know that it’s absolutely possible to continue breastfeeding. I want you to be proud of your decision to continue breastfeeding, and I want you to be confident in your ability to do so. I want you to avoid stress as much as possible and enjoy your baby’s first year. It really goes SO fast, and with sleep deprivation, it’s hard enough to enjoy it. The following links will take you to all of the blog posts that I have written about MSPI, from how to determine whether or not your baby has it, to what is safe for you to eat. It’s everything you need to know so that you can continue on with breastfeeding, even if it means making a few sacrifices (mainly in the form of cheese). 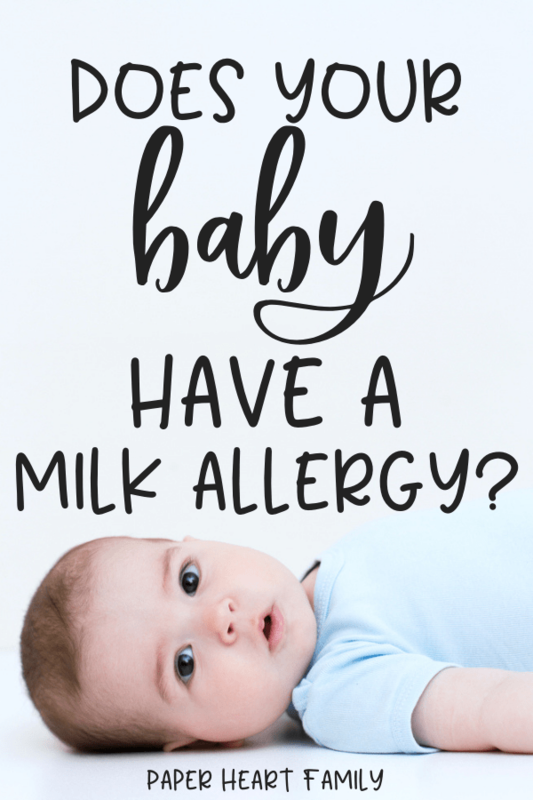 If you’re here to determine whether or not your baby has a milk allergy, the following resources will help you to at least be informed on the topic before approaching your Pediatrician. I know many moms whose Pediatricians have blown off their baby’s symptoms as “colic”, so going in prepared for an uncooperative opinion could definitely help you out. FYI- Pediatricians are often poorly educated on breastfeeding (sadly) and therefore will not be even less educated on milk allergy in babies that are breastfed. Fussy Breastfed Baby– If your baby has “colic” or is exceptionally fussy, there are many possible causes (some of which unfortunately have the same symptoms as MSPI). This post would be the first step. This will help you rule out any other potential problems. Causes of Gas in Breastfed Babies– There are also many factors that can contribute to excessive gassiness in babies. Babies are difficult, right?! 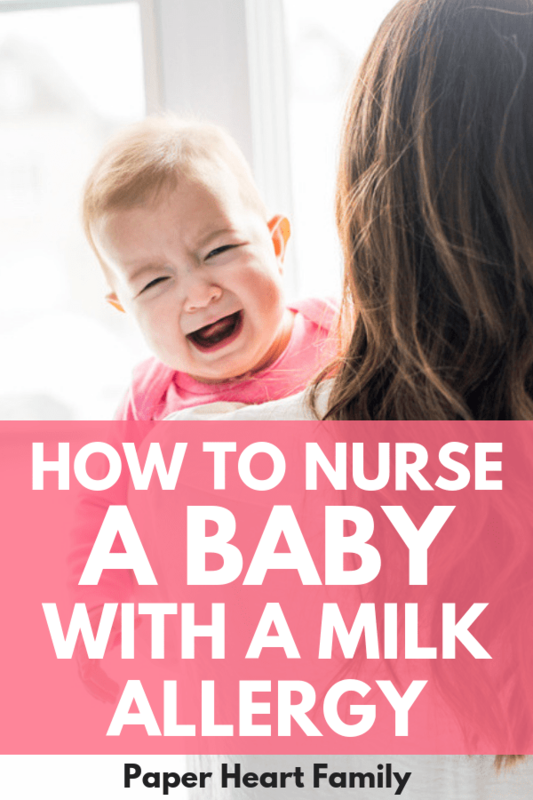 If gassiness is your main reason for suspecting a milk allergy, be sure to read this post that talks about not only a milk allergy, but 8 other things that could also be causing your baby’s gas problems. Milk Allergy Symptoms In Babies– Do you know the symptoms of milk allergy in babies? If you’ve decided that your baby’s fussiness is NOT from any other cause, now you need to learn the signs of milk allergy in breastfed babies. Causes Of Blood In Baby Poop– While blood in a baby’s stool ALMOST always indicates a milk allergy, it’s not the only cause. Just Found Out That Your Baby Has A Milk Allergy? MSPI Baby Beginner’s Guide– Find out what you NEED to know right now in order to get started cutting dairy (and possibly soy) from your diet, how long milk allergy symptoms last, and when babies outgrow a milk allergy. Each and every recipe that you will find in the following posts are quick and simple recipes, because I know you don’t have time for anything else. 7-Day Meal Plan– Need a step-by-step meal plan to get you started? I’ve got you covered! Dairy Free Breastfeeding Diet– Learn about how strict your diet needs to be, what hidden ingredients you need to avoid, and discover some delicious breakfast and dinner recipes. Dairy And Soy Free Dinner Recipes– Even more quick dinner recipes, because can you really ever have enough? The answer is no. Dairy And Soy Free Snacks– A trip to the grocery store for some convenient snacks can leave you depressed and hungry. This post will tell you what snacks you can actually eat. Dairy And Soy Free Desserts– Got a sweet tooth? I likely wouldn’t have made it through over 16 total dairy and soy free months without these yummy dairy and soy free desserts. Complete Guide To Breastfeeding The Baby With MSPI– My complete, all encompassing guide that will teach you, from start to finish, how to manage your child’s MSPI. It also includes over 100 recipes. It’s everything you need in one resource. If you found this post helpful, make sure to pin it to reference later! Remember, this little bump in the road is extremely temporary, and before you know it you’re “baby” won’t be a baby anymore, and you’ll be back to eating all the dairy and soy that you want.